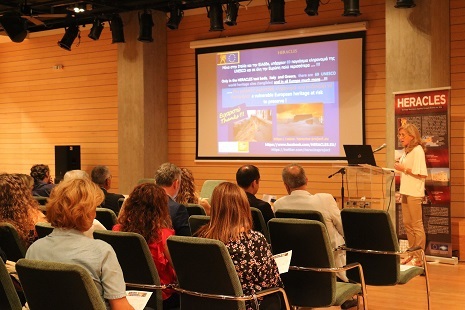 As part of the project’s dissemination and public engagement a social event was organized with the aim to estimate the social impact, the societal resilience and the awareness on cultural values in Heraklion. The event was organized in Heraklion-Crete, on the 5th of October 2018 following its twin event that took place in Gubbio, Italy on the 5th of June 2017. The social event was organized by Ephorate, FORTH and CNR. in the morning an open-public conference took place which was attended by more than 65 people. During this morning session the project itself as well as highlights of the research works in Crete were presented as an introduction by the coordinator (G. Padeletti) and the project partners (V. Sythiakaki, E. Kavoulaki, E. Kanaki, P. Pouli,). Furthermore, the effects of climate changes on the socio-economic and cultural impact in the local community and in Greece in general were also presented by experts from the research community (prof. N. Kampanis) and the Greek Ministry of Culture (Dr P. Prokos, Dr. S. Skartsi) while a case-study describing the important relationship between the local communities and conservation was discussed by a conservator representing the NGO “Diadrasis” emphasizing the case study of Martos in Spain (L. Μ. Τapini). The role of the local authorities was very important in this morning session with opening remarks given by representatives from the Region of Crete (Mr. K. Fasoulakis, Thematic Deputy Regional Governor of Culture and World Hellenes Abroad and Ms E. Kargaki, Directorate of Environment & Spatial Planning) and by the municipality of Heraklion (Mr I. Anastasakis, and Mr M. Pattakos, Vice Mayors of Heraklion). Mr Anastasakis, vice Mayor of Infrastructure and European Programmes had also the chance to present the planning of the municipality of Heraklion as regards its monuments facing the new challenges with emphasis to the climate change effects. His talk was entitled “From the city walls to the walls of the city”. In the afternoon session a preparatory workshop took place in which 15 people of different expertise and background were invited. Specifically a number of people constituting the local community, the cultural heritage and the touristic sector, construction companies, students and young researchers from different fields of expertise as well as representatives of the municipality were involved in this participatory workshop regulated by CNR (P. Grifoni and F. Ferri) and FORTH (G. Alexandrakis and A. Siatou). The participants were involved in a discussion stimulated by a series of questions leading to conclusion on the socio-economic and cultural impact of the HERACLES project in the local community and suggestion on how the results of the project can be further employed into the development of smart systems for monitoring change in the condition of the monuments, systems and methods for raising public awareness and enhancing the involvement of the public into the protection and safeguarding of cultural heritage assets.